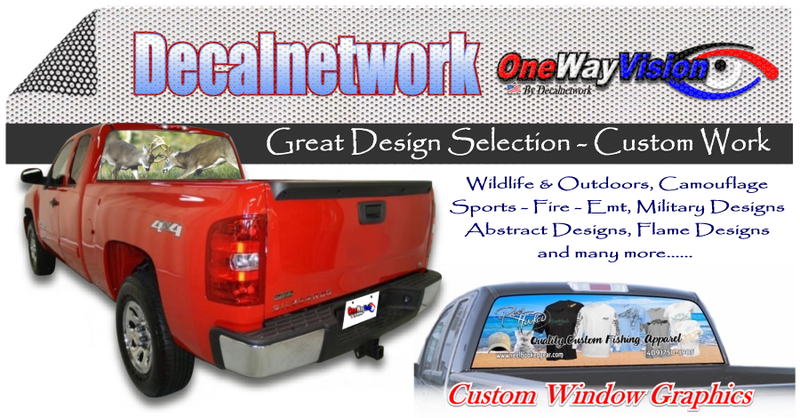 View -Thru window graphics are an awesome add on to any truck or Suv. We carry a great selection of designs that we print in house. We also do custom work. Note: make sure by law these are allowed in your state. Window film has perforated holes to allow vision from the inside out/ while blocking most vision from the out side in. As this is great for privacy and protecting your vehicle interior from harmful UV rays. Rain and snow will collect in the holes and block vision until it drys out. Although not needed, we offer lamination too stop this and also lenghten the life of the graphic.